Welcome to Share Your Sci. This site is for you if you are a researcher and you’re interested in sharing your work with a new audience. Maybe you’re asked to speak at a public event. Maybe a journalist contacted you with questions about your field of expertise. Maybe you’re collaborating with researchers in a different field. These situations can be challenging, because you’re asked to communicate in a new way, for a different audience. 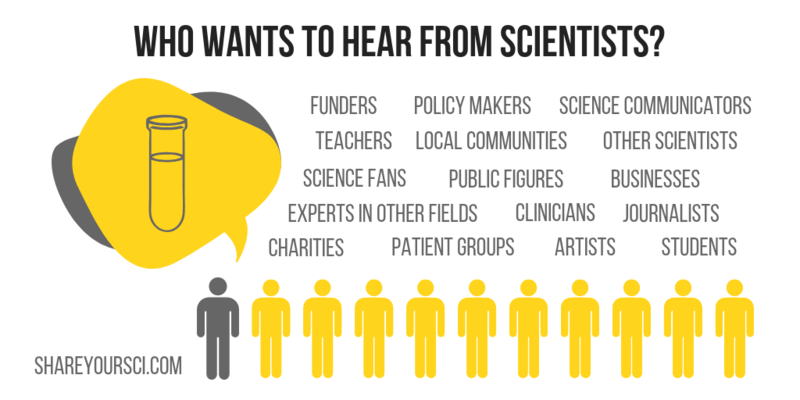 As a scientist, you have many different audiences, who are all interested in your work. Share Your Sci can help you reach them when you need to. How do I use Share Your Sci? Share Your Sci is regularly updated with short articles that tell you everything you need to know about everything from open science to public engagement. The monthly newsletter features a few of these very short articles, including Coffee Breaks — short activities that you can do on your coffee break to gain a new science communication skill. Some articles on the site are a bit more in-depth and tap into the formal science of science communication. Other articles are brief introductions to concepts or resources, or short practical tips. If you need more support, you can hire us for your science writing and communication needs. We also provide occasional training in the form of webinars and workbooks. Who created Share Your Sci? Share Your Sci was created by Eva Amsen, a UK-based science writer and communicator. Eva has a PhD in Biochemistry from the University of Toronto, and a decade of experience working in science communication roles for academic publishers and research groups. She has been a visiting speaker at universities across Europe and North America and understands the challenges that researchers face when it comes to finding time to learn more about science communication. Eva created Share Your Sci to provide a place for busy scientists to quickly find the information they need to effectively share their science.